My favorites vary. It depends on the current activity at each site. In the United States, in addition to the Myrtles Plantation, I like the ghosts of Houmas House. Both sites are in Louisiana. In New Orleans’ French Quarter, I always stay at the happily haunted Hotel Monteleone. A good night’s sleep plus some odd encounters and great ghost stories…? It’s an ideal mix. And, based on my ley line research, I spend time in a park on the edge of the Quarter… but there’s no house there, haunted or otherwise. 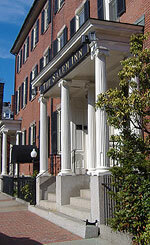 I’ve been very impressed by the ghosts of the Salem Inn in Salem, Massachusetts. Also, I’m fascinated by the old pirates’ tunnels beneath Essex Street. Several buildings adjoining it have dramatic ghost stories. Salem’s Witch House is an interesting case with surprising physical phenomena, even in broad daylight. In nearby Danvers, I’m drawn to the remains of Rev. Mr. Parris’s home, as well as Whipple Hill (aka Witch Hill) near Endicott Park… but the hill has no “haunted house,” either. In England, I like the Falstaff’s Experience. I also like Warwick Castle, just a few miles away. So far, Falstaff’s Experience is the most intensely haunted site I’ve been to, anywhere in the world. Also around Stratford-upon-Avon, I like the Falcon Hotel and Ettington Park Hotel. York (city) has more eerie and interesting haunts than I can list here. The Golden Fleece is the tip of the iceberg. And, though it’s not quite a haunted house, I like the Tower of London. Each part of the Tower complex has fascinating ghost stories. Usually, visitors can see physical evidence supporting the Tower’s paranormal history. As you can see, only a few haunted houses and hotels stand out among my favorites. However, my list of haunted cemeteries, parks, and lakes, and haunted beaches would be a lot longer. Previous Previous post: How can I get my own ghost hunting TV show? Next Next post: How can I see a ghost?